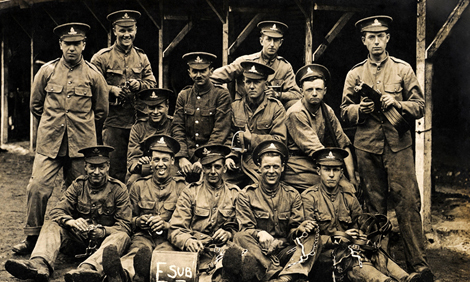 This photograph shows a group of young British soldiers during the early years of World War I. A new project is making it possible for people to read the writings of British soldiers who fought in World War I. The soldiers’ diary entries are being put online as part of the centennial, or 100-year anniversary, of the start of the war. Workers at the British National Archives have been busy scanning and uploading the documents to a website. The diaries are a record of daily life in British military units. The soldiers in these units were required to write journal, or diary, entries every day. The British National Archives has about 1.5 million pages of diary entries. About one-fifth of them have been digitized and put online so far. They hope to have all the diary pages online by the end of 2014. Many of the diary entries read more like logs of each day rather than personal accounts. These logs include daily activities, such as marches and other military exercises. There are some personal stories, too. These accounts of soldiers’ lives are especially important now because there are no longer any living British veterans of World War I. The British National Archives is also launching a crowdsourcing project called Operation War Diary. It asks “citizen historians” to help tag data, such as people, places, dates, and activities. People who volunteer to help with the operation can view the diary entries for free. Otherwise, there is a fee for downloading them. The soldiers’ diaries will become part of a larger project called Lives of the First World War. This project, which began in February 2014, is hosted by the Imperial War Museum. It will gather the diaries, family photos, and other memorabilia of British civilians who lived during the time of World War I. These documents will be collected from museums, libraries, archives, and family collections. Learn more about the project to digitize British World War I records and how to search the database. Read or listen to a news story about the digitization of the British WWI diaries and view the article’s photos. What did most of the soldiers' diaries record?